Transverse pavement markings usually consist of transverse bars or chevrons that are typically spaced to give drivers the perception that they are speeding up. Transverse chevrons (Shauna Hallmark et al./Institute for Transportation). Transverse pavement markings usually consist of transverse bars or chevrons that are typically spaced to give drivers the perception that they are speeding up. This perception encourages drivers to be aware of their speeds and to slow down. 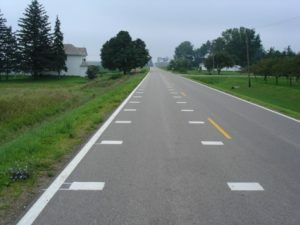 Transverse pavement markings are appropriate for rural traffic calming, especially in transition zones where drivers are being reminded of a change in roadway character. Transverse lane markings (Shauna Hallmark et al./Institute for Transportation). 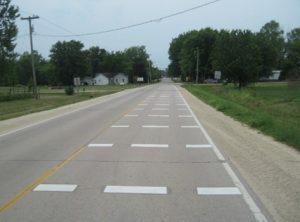 A study in Minnesota used a converging chevron pattern in each travel lane as a traffic-calming measure (Corkle et al. 2001). Reductions of 5 and 3 miles per hour (mph) in mean speeds (depending on the lane) were observed and 7 and 5 mph in 85th percentile speeds. Also, a study using transverse pavement markings to slow traffic at a community entrance (Hallmark et al. 2007) found decreases of up to 2 mph in mean and 85th percentile speeds. 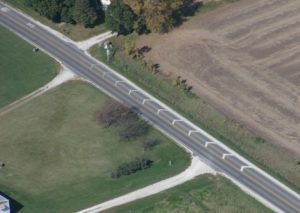 Transverse markings are low cost besides the initial cost to lay markings and the cost of subsequent maintenance.